I was so happy to work with these beads again. I've had the earrings in my shop inventory for quite a while and just love them. They were purchased this week with a request for a matching pendant which is shown here in the center...not quite finished. I couldn't figure out why no one was buying them and thought perhaps it was because mostly cupcake lovers visit my Etsy shop. The customer told me she loves wearing really unique jewelry to work as everyone comments on it...and that's why she wanted this set. It was a long wait for these to be snapped up but it sounds like they were waiting for JUST the right person to appreciate them. It's good to know that my work is a stand out. I ordered a bunch of various bails so I can make more pendants and necklaces, so if you need anything in particular, let me know. Could life be any sweeter than this handmade glass ice cream sundae? 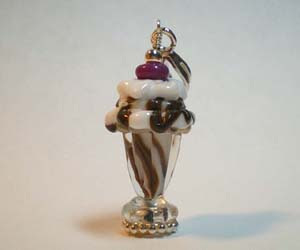 Lezlie Belanger created this lush goody and I added some silver to create a pendant. I listed it, watched a movie, returned to the shop and it had sold! So I guess you could say that ice cream sundaes sell like hotcakes. The detail is phenomenal and it is difficult for my mind to wrap around the truth that this is, in fact, NOT a real ice cream treat! I love the snazzy spacer at the bottom. It reminds me of the doily that is usually placed on the plate before a sundae is presented in an ice cream shoppe. I better order more of these so that no one feels left out of wearing one for summer fun. 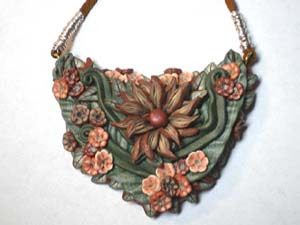 On the flip side, I finally made a necklace out of ZudaGay's awesome polymer clay piece seen here. The detail is so deep and rich. The texture reminds me of carved wood. I hand wound .999 fine silver around the suede leather cord and found a cool Bali clasp that also has that wound silver feature. If still available, you can see it on my Etsy site along with other planned pendants & necklaces. 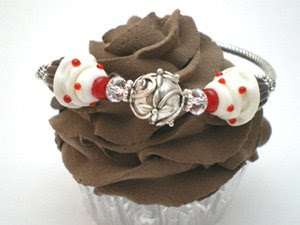 I've got a new spin on my cupcake bracelet...this one has chocolate cupcakes with ivory frosting, a red cherry and matching sprinkles. They were a special request by a new friend of mine that is soon to open a cuppie shop using these colors. 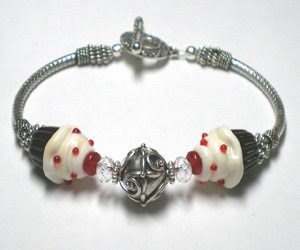 This turned out beautifully, particularly with that awesome hollow Bali silver bead front & center. Nice. I'm picking up the pace now as jewelry orders are flowing in more steadily...pretty exciting. I also have had my Minnie Glam earrings featured in a treasury on Etsy, so we'll see what kind of traffic that will bring to my sites. We are sweating here east of the San Francisco bay...100 degrees today. My husband has long wanted a portable air conditioner for our second floor and I always thought it was a waste of money for what usually turns out to be MAYBE a total of 3 weeks of intense heat each year...well, for us anyway...near 100 is extra hot here. Well, we finally got the darned thing and now the hottest room in the house has become our coolest so I love it. I stay downstairs on days like these except for using the computer. So, I close everything up in that room before I start dinner so that it's cooler when my husband gets home work. In the past, he felt his energy was sapped by the heat and sometimes he would sleep downstairs just to have cooler air. We have dinner and then go back up there and chat and watch some t.v. It's reviving to have the coolness, so it turned out to be a good investment, plus we can roll it from room to room where needed. Simple to hook up too! I've adjusted my MomsArt site to a boutique style. I've been finding fun stuff usable in crafting, scrapbooking & card making so I decided I'd make the shopping there a surprise...you never quite know what you'll find there so it's fun to keep returning. 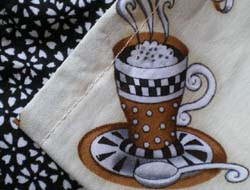 Check it out at www.MomsArt.Etsy.com. It's time for pendants! 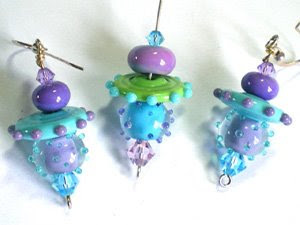 My friend Sandy gave me a good wake up call telling me I need to make my cupcakes and other sweet beads into pendants rather than just earrings & bracelets. She is so right and now that I have the materials to do so, there's no need to put it off any longer. I got some beautiful leather & suede strands that are quite thin which give them the supple quality and feel of ribbon...really nice! 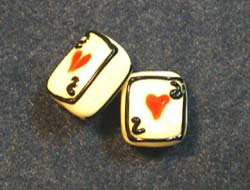 Two of the items that will be become pendants are these fabulous glass bead replicas of playing cards. They are fat and chock full of personality and perfect for visits to casinos or even bingo nights. One of a kind, THAT's for sure. Destash..interesting term. Never heard of it until I joined Etsy. Destashing is a very good thing...cleaning out the old to make room for the new. That cup of coffee you see in the photo is actually a gift bag! I've got several gift bags I've never used since I decided to use boxes, so I added them to a new Destash category at www.RockerJewlz.Etsy.com. My hollow black & white beads are on their way to me. I breathlessly await the creations I will design with them. I can hardly wait to show you!